Learn how to access Atlantic County Office of GIS data from your desktop using the free ArcExplorer GIS software available from ESRI. Click here for our tutorial. Click here for the tutorial in PDF format. Add aerial and other raster data into your ArcMap session automatically. Click here to view the pdf file. Or to download a zip file that contains the code script click here. Save these files right to your desktop by right clicking on these links and then select ‘Save Target As’ from the pop-up menu. Atlantic County’s 2006 entry into the Poster Session of the MAC URISA conference. This poster details instructions on how to use the Atlantic County Site Investigator and walks step by step through a property investigation. To view the historic aerial views available for Atlantic County please click here to visit Atlantic County's GIS Meta Data Historic Views Page. The Atlantic County Ride Guide is a resource for public transportation. 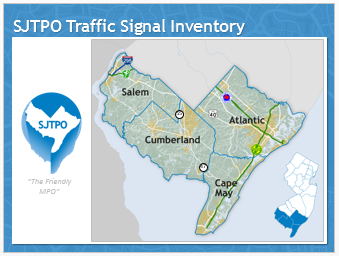 Here you will quickly find information regarding all modes of transit including car rentals, airport and rail information within Atlantic County. Flood hazard mitigation presentation of findings was presented by the Office of GIS, Office of Emergency Management and the County Administrator to the municipalities on October 5, 2007. Click here to download the completed paper and for a preview of some of the maps developed from this study. 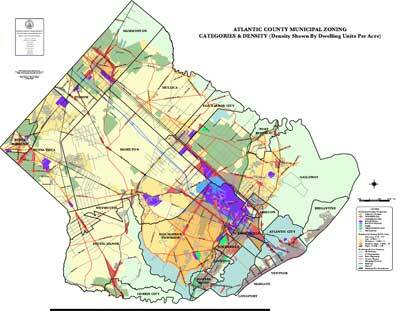 The maps and data tables contained within this Adobe PDF file display the results from the Atlantic County Smart Growth Project.